Brian Brock and John Swinton, eds. For two millennia Christians have thought about what human impairment is and how faith communities and society should respond to people with perceived impairments. But never has one volume collected the most significant Christian writings on disability. This book fills that gap. 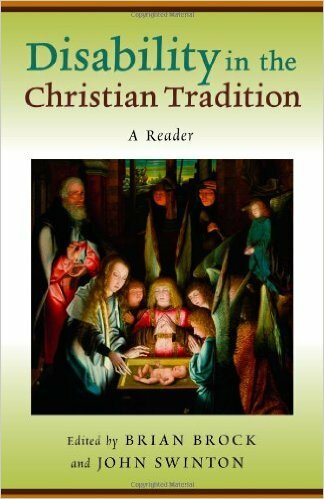 Brian Brock and John Swinton’s Disability in the Christian Tradition brings together for the first time key writings by thinkers from all periods of Christian history – including Augustine, Aquinas, Julian of Norwich, Luther, Calvin, Hegel, Kierkegaard, Bonhoeffer, Barth, Hauerwas, and more. Fourteen contemporary experts in theology and disability studies guide readers through each era or group of thinkers, offering clear commentary and highlighting important themes. From the publisher.